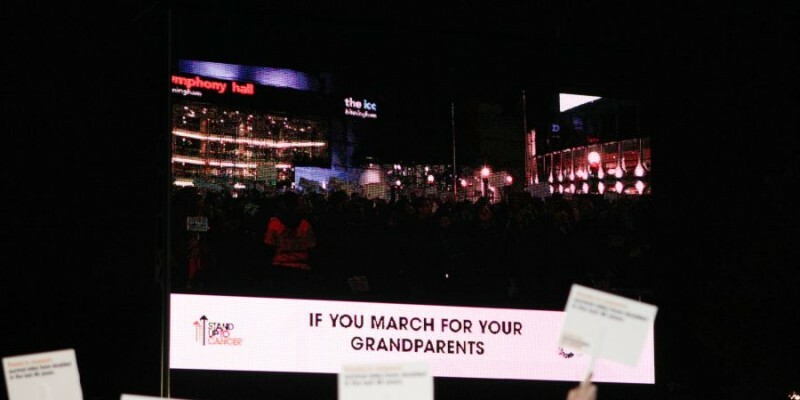 Cancer Research brought the March On Cancer event concept over from Cancer Research America in 2012. The simple premise of the event is a sponsored March. However the event is much more than that – the events main aim is to deliver content that will empower people to continue to raise funds for cancer research after the event. The event is also there to allow people to celebrate and remember the lives of people they have lost to cancer. 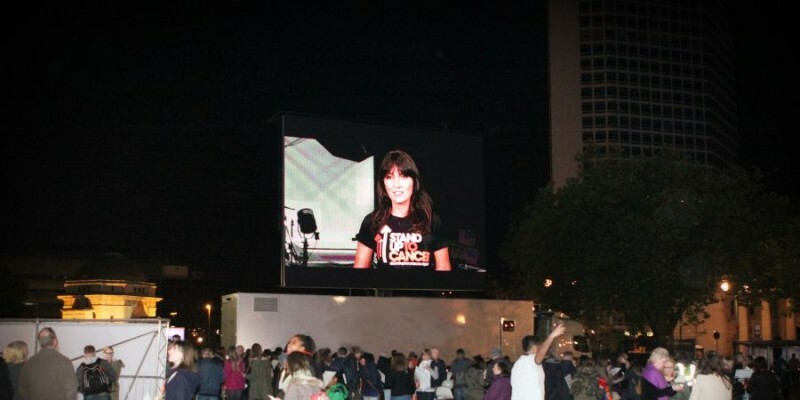 The event was to be very closely linked to the Channel 4 Stand Up To Cancer fundraising programme. Cancer Research came to Showcase AVi for expertise about what equipment they would need and how best they could deliver the content across the 15 simultaneous “marches” they would be staging. 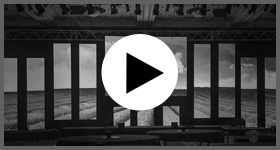 They needed to be able to show content that would “empower” the participants, and it needed to be delivered in an interactive way with as much audience participation as possible in order to really hammer home the message. Ben Collings, Sales Director of Showcase AVi met with the Cancer Research UK’s events team several times to plan the best equipment and method for encouraging audience participation. 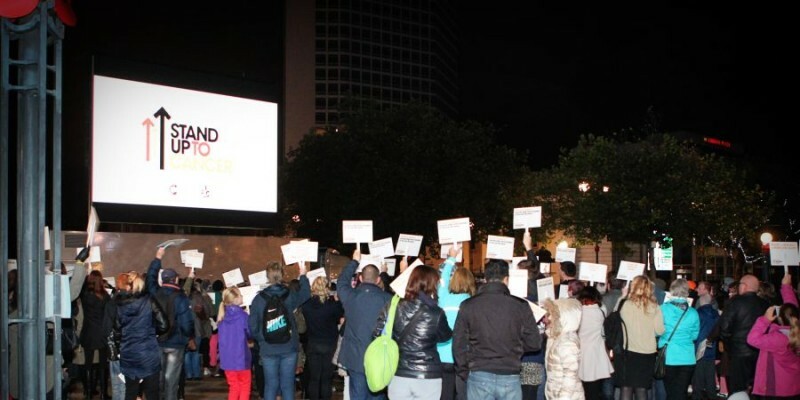 Our recommendation was simple but effective – each location would be provided with a large LED screen positioned at the start point of the city centre March – compelling video content would be shown on the screens prior to the March to empower the participants. 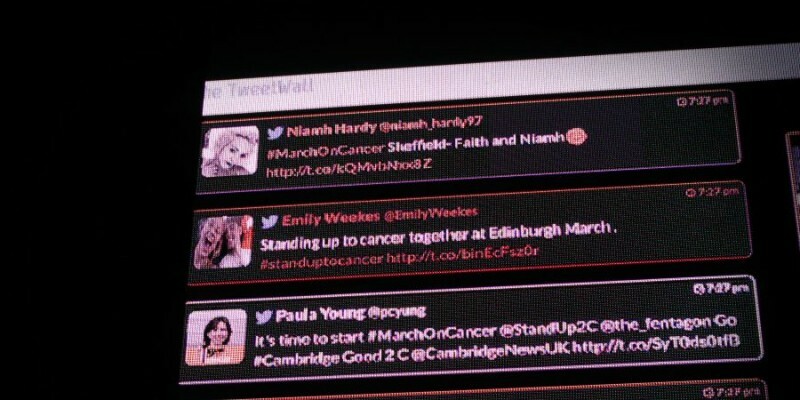 We recommended that the best way to encourage audiences to really engage with the event and provide content would be to use our new social media software Audience – it allows users to send Twitter, Facebook or SMS messages into the event using the March on Cancer hashtag, these would be displayed on the screen for all participants across the 15 events to see. The LED screens were to be programmed in a way that would allow more than one picture to be shown on the screen at any given time so video content could be shown at the same time as Audience. This form of audience participation helped to achieve one of the main goals; to make all participants feel like they were part of a collective force, to empower, inspire and create a movement. In order for the social media element to work, a guaranteed internet connection was required at every site – something that couldn’t Cancer Research couldn’t be certain of without additional hardware, therefore they used MI-FI devices at each site to ensure a reliable internet connection. 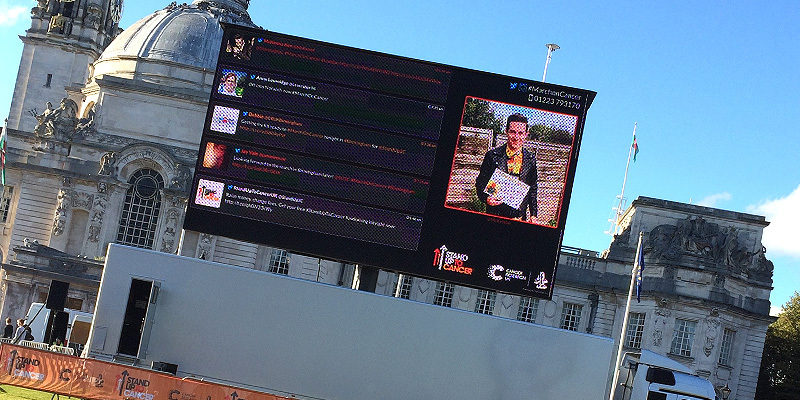 The Audience social media software helped Cancer Research UK to achieve some staggering results; by the end of the weekend that the March took place there had been 23.8 million tweets, #MarchOnCancer was trending UK wide and there were a total of 2,447 social media users interacting live with the event. 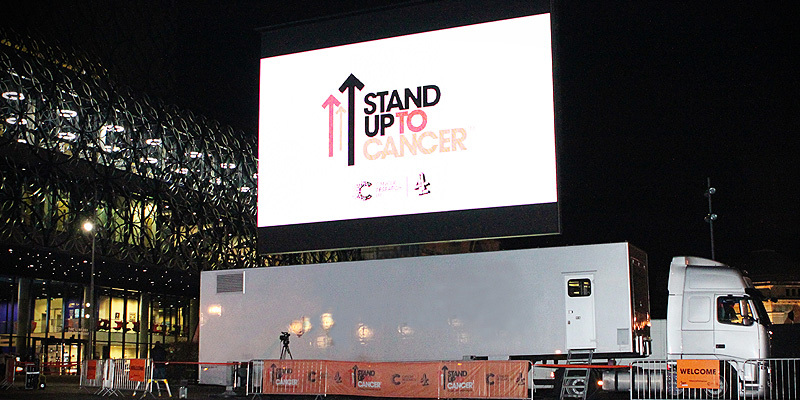 The March kicked off social media conversations ahead of the live Stand up to Cancer Channel 4 TV programme the following weekend and got a real buzz going. We have to ask ourselves, without the initial engaging Social Media experience that helped Cancer Research UK to interact with a wider audience than just those participating in the event would the Stand up to Campaign have gone on to raise a staggering £15.5m? “I wanted to drop you a line to say one big fat enormous thank you. Please can you pass on my heartfelt thanks to everyone in your office and all the crews and AV techs who helped us to March On Cancer across the UK on Saturday evening, and give it a dry run at our Test Day. Dave – you’ve always been at the end of the phone to answer my questions with clarity and patience – thank you.